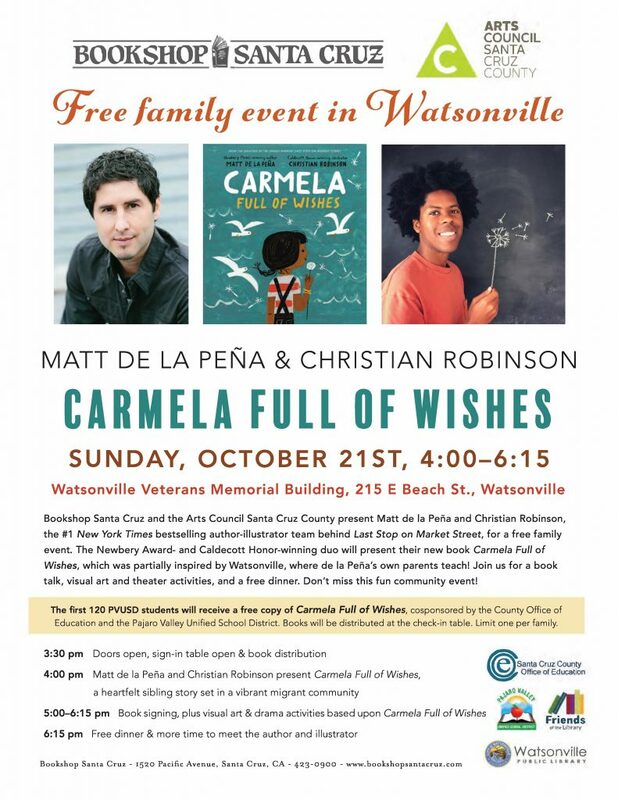 Bookshop Santa Cruz and the Arts Council Santa Cruz County present Matt de la Peña and Christian Robinson, the award-winning, #1 New York Times bestselling author-illustrator team behind Last Stop on Market Street, for a family event in Watsonville. They will be celebrating their new book, Carmela Full of Wishes—a story partially inspired by Watsonville, where de la Peña’s own parents currently teach. Join us on Sunday, October 21st, for a fun-filled family event, where Matt and Christian will share and sign Carmela Full of Wishes. 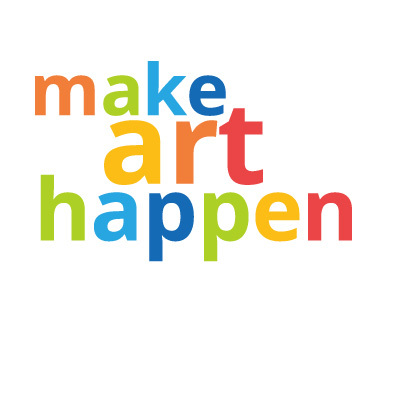 The festivities will also include visual arts and theater activities, and food will be provided. Seating will be open, and on a first-come, first-serve basis. To request special accommodations, please e-mail bookshopevents@gmail.com by Friday, October 19th. If you have any ADA accommodation requests, please contact bookshopevents@gmail.comby October 20th. This event is presented by Bookshop Santa Cruz and the Arts Council Santa Cruz County, and is cosponsored by the Santa Cruz County Office of Education and Pajaro Valley Unified School District Family Literacy Program. A moving ode to family, to dreamers, and to finding hope in the most unexpected places, this “powerful and beautiful” (Kirkus, starred review) picture book celebrates the vitality of migrant communities through the lens of a heartfelt sibling story. When Carmela wakes up on her birthday, her wish has already come true–she’s finally old enough to join her big brother as he does the family errands. Together, they travel through their neighborhood, past the crowded bus stop, the fenced-off repair shop, and the panadería, until they arrive at the Laundromat, where Carmela finds a lone dandelion growing in the pavement. But before she can blow its white fluff away, her brother tells her she has to make a wish. If only she can think of just the right wish to make . . .
Matt de la Peña is the #1 New York Times bestselling, Newbery Medal-winning author of five picture books (including Last Stop on Market Street, Love, and the upcoming Carmela Full of Wishes) as well as six critically acclaimed young adult novels. In 2016, he was awarded the NCTE Intellectual Freedom Award. He received his MFA in creative writing from San Diego State University and his BA from the University of the Pacific, where he attended school on a full athletic scholarship for basketball. He lives in Brooklyn, NY with his family. Christian Robinson is a 2016 Caldecott Honoree and also received a Coretta Scott King Illustrator Honor for his art in Last Stop on Market Street, a #1 New York Times bestseller. His picture books include the Gaston and Friends series; Leo: A Ghost Story; School’s First Day of School; The Smallest Girl in the Smallest Grade; Josephine: The Dazzling Life of Josephine Baker; and many more. Robinson, based in Sacramento, is also an animator and has worked with The Sesame Street Workshop and Pixar Animation Studios.